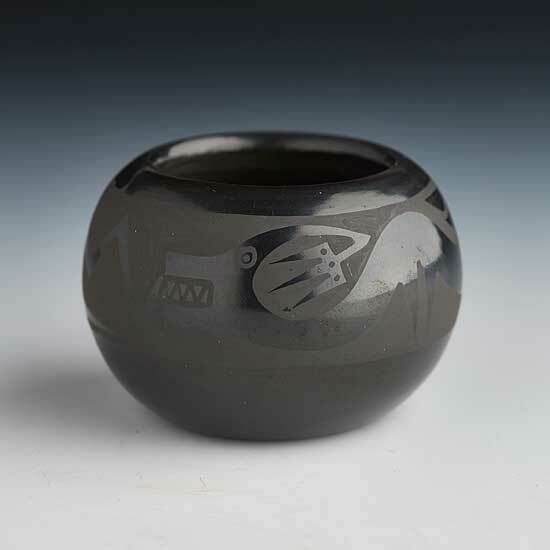 This small bowl is a perfect example of their current work, designed with the classic avanyu (serpent) imagery. It is a lovely shape and shows outstanding polishing. Marvin Martinez is the great – grandson of internationally renowned potter Maria Martinez. 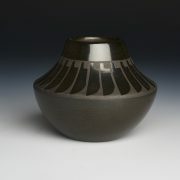 Black-on-black pottery was made famous by Maria Martinez and her husband beginning in the early 1900’s. They invented a special technique that would allow for areas of the pottery to have a matte finish and other areas to be a glossy jet black. For more than 15 years, Marvin and his wife, Frances Martinez, have been carrying on the tradition first taught them by their ancestors. “I grew up watching my grandparents and my great grandmother Maria doing the pottery. Seeing that really benefited me,” said Marvin. He paints the pottery and Frances does the polishing. “My ancestors used a Yucca brush, but I use a liner brush made of fine camel hair so I can get the delicate designs in my pottery,” he said. Marvin said he often incorporates the “Avanyu,” or ancient rain serpent, as well as feathers in his work. 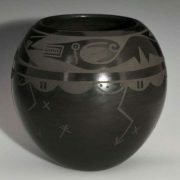 Marvin and Frances Martinez are continuing the family tradition of hand coiling and designing black on black pottery. The Martinez couple says, ‘There is a beauty that our pottery brings to your eyes, wonders that it brings to your minds and the loving memories that it brings to your heart. Continue to love and enjoy the ‘gift of beauty’ the art of traditional matted ‘black on black’ pottery.” Both are now teaching their children the old-style pottery taught to them.